A lfredo De Braganza nació en Alicante. Acreedor de premios internacionales por su faceta de guionista, productor y director cinematográfico, ha viajado por diferentes países y trabajado en diversos campos. Durante muchos años ha vivido en la India. Inicia su carrera literaria con una biografía novelada, sorprendiendo a los lectores por sus singulares dotes narrativas y poderosa imaginación. Posteriormente, confirmó su talento con varias obras en las que se desmarca de su trayectoria inicial con el género del thriller. Actualmente trabaja en su siguiente novela. 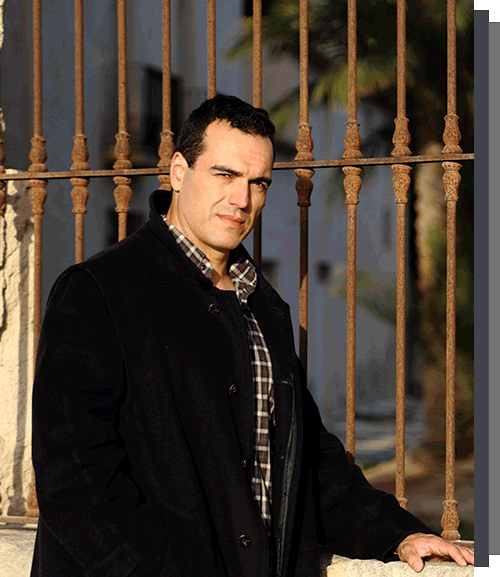 Alfredo de Braganza is the winner of international awards for his role as scriptwriter, producer and film director. He has traveled to different countries and has worked in various fields. Over the past 15 years he has lived in India. His feature documentary in Hindi language Smoking Babas Holy Men of India, was premiered at the International Film Festival of Madrid. His feature film in Tamil language Maayan The Fisherman, was nominated for best independent film in the United States; a production that made him the first Spanish person to make a feature film in India, on celluloid and native language. His documentary on Indian boxing, Boxing Babylon-The Story of Olympic Deva, was awarded in Norway and in prestigious international festivals in South Asia. He has lived in India, where he spent months in a nomadic trip around the country traveling through all states by trains, local buses and vans. That experience in encountering for so much time the cults and customs, creeds and cultures, faiths and tongues, made him to obtain an immense knowledge about the living habits, geographical, social systems and linguistic diversity that defined India.